The locals swear by the green peace oasis in the centre of Vinohrady, the so-called Grébovka. They don’t use the official park name – Havlíčkovy sady. If you love well-tended parks with water elements and old traditions, you will be excited. Moreover, you can taste a glass of with wine from the local hillsides while enjoying the enchanting views of Prague. The grand park in the Italian Renaissance style was established near the residence of industrialist Moritz Gröbe in 1871–1888. The luxury area, including a three-storey Neo-Renaissance villa, vineyards and a gazebo, an artificial grotto, a garden pavilion and the of Horní and Dolní Landhaus homesteads, cost Gröbe a staggering sum of 1 760 000 Austrian-Hungarian crowns – today, it would be around half a billion Czech crown. The industrialist built the summer residence on the site of the original vineyards established by Charles IV in the 14th century. After Gröbe’s death, members of the Habsburg imperial family lived there as tenants. The area was named Havlíčkovy sady and opened to the public until 1905, when it was bought by the municipality of Vinohrady. Since then, the Gröbe villa has served various groups – the Forestry College, the Hitler Youth during the Second World War, and the Pioneer movement during socialism. Today, the large building is used as an educational centre by a private investor. The local vineyard with an area of 1.7ha produces about 4,000l of wine a year. Müller Thurgau, Riesling, Hibernal, Dornfelder, Pinot Noir, Neronet, and Pinot gris thrive well on the sunny hillside. 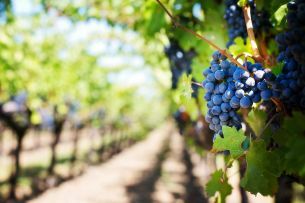 Not only visitors of the “Vinohrady Grape Harvest at Grébovka”, held every September and accompanied with many other events, can test their quality. From the turn of the millennium to 2013, the popular Grébovka park was lost in muddy ploughed soil full of construction machines. The extensive renovation of the park took 15 years and cost CZK 365 million, mostly paid by the municipality of Prague 2. All the historic buildings, the pavements, the playground and the complete stone fence were reconstructed. The whole project was awarded for historic preservation by the National Heritage Institute. You can spend a sunny day at Grébovka doing many things. Besides romantic walks with beautiful views of Prague, passing the local pond, fountain and water cascade, you can play pétanque or skittles on a historic lane. Take a look at the reconstructed artificial grotto from the 19th century or relax in the local gazebo or the Grébovka café. Parents and children will like the large playground with modern attractions and toilettes. Thanks to the fence, security guards and day-time opening hours, the park is perfectly safe and the pavements are suitable even for prams. You will get to the northern part of the park and to the playground from Rybalkova and U Havlíčkových sadů Streets. They are accessible from Jana Masaryka or Ruská tram stops.